Hormel Foods Corporation (NYSE: HRL) today announced the availability of fortified poultry-based spread (FPBS) for purchase under Title I for U.S. Department of Agriculture (USDA) feeding programs and Title II for U.S. Agency for International Development (USAID) programs. FPBS yielded promising results in nutrition research. The product was designed by Hormel Foods and was created to help address malnutrition in children. FPBS is used as an ingredient that blends easily into customary diets, and the fortification can be customized to meet the needs of the recipient population. 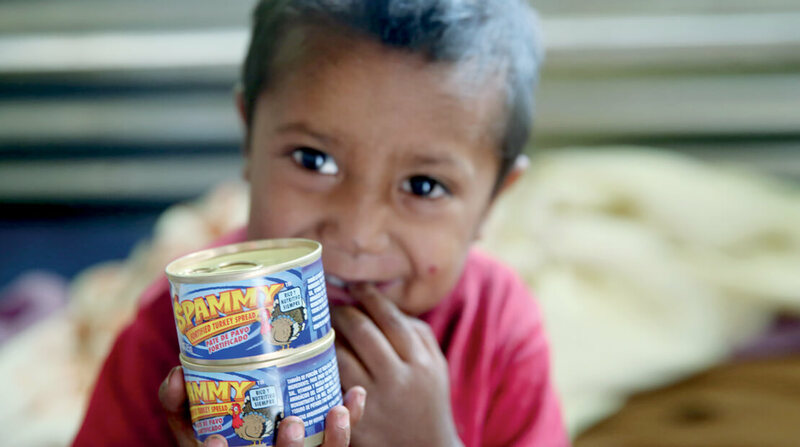 For example, the product was tailored to meet the specific micronutrient needs of children in Guatemala based on findings from earlier research conducted by Hormel Foods (known as Project SPAMMY®). In a public/private partnership jointly funded by Hormel Foods and the Micronutrient-Fortified Food Aid Products Pilot (MFFAPP), administered by the USDA’s Foreign Agricultural Service under the McGovern-Dole International Food for Education and Child Nutrition (McGovern-Dole) Program, this latest research demonstrated the benefits of supplementing traditional diets with high-quality protein and micronutrients. During the trial, more than 160 preschool-age children in Guatemala ate either a fortified or unfortified version of FPBS on school days over a 20-week period. The fortified version contained the addition of several micronutrients, such as vitamins D and B12, which are important nutrients for children, but are deficient in this area of the world. Both versions were identical in protein, calories and fat. A positive correlation was found between increase in cognitive gain scores and vitamin D concentrations in the treatment group. “It is encouraging to see these results and the success that FPBS is having in improving the lives of so many children in need,” said Kevin L. Myers, Ph.D., vice president of research and development at Hormel Foods. Hormel Foods has been working with partners in Guatemala since 2008 to provide FPBS to malnourished children and donated 2.5 million cans of the protein-based item in 2014. Hormel Foods and its partners, Caritas and Food For The Poor, are also building opportunities for thousands of families by providing FPBS to 8,300 families, representing more than 30,000 children in Guatemala. Additionally, Hormel Foods provides scholarships to eight high school-age students to attend the Villa de los Niños boarding school in Guatemala City. Millions of children throughout the world suffer from chronic malnutrition. Our company’s collaborative effort was built on the premise that changing lives occurs only through building sustainable solutions. The project focused on delivering proper nutrition through our expertise in protein and through partnerships. Together with the USDA, Food For The Poor and in-country partners Center for Study of Sensory Impairment, Aging and Metabolism (CeSSIAM) and Caritas, we implemented a feeding program to evaluate the benefits of FPBS for preschool-age children living in a low income area of Guatemala. The project was evaluated by an external consultant and was jointly funded by Hormel Foods and the Micronutrient-Fortified Food Aid Products Pilot (MFFAPP), administered by the USDA’s Foreign Agricultural Service under the McGovern-Dole International Food for Education and Child Nutrition (McGovern-Dole) Program. A total of 167 children at a daycare center located in Ciudad, Peronia, a semi-rural city approximately eight miles outside of Guatemala City, Guatemala, completed the randomized, double blind trial. The control group received a daily meal containing unfortified product, and a treatment group received a fortified version. The fortified product contained a vitamin and mineral blend that included, among other micronutrients, vitamin D, several B vitamins including vitamin B12, iron, zinc and iodine. Anthropometric measurements and blood draws were completed at both baseline and endline; a subset of 60 children completed cognitive tests before and after the 20-week trial. Meals containing the product were prepared on-site and were served at the beginning of the school day. A 2-week rotating menu was created that incorporated the product into traditional foods such as doblada, tostada, chuchito, rice and black beans. Four women were hired from the community to monitor and record consumption and liking. The meals were well accepted among the children throughout the 20 week intervention. Vitamins D and B12 were low in many of the children at the beginning of the project. Overall 59 percent of the children had vitamin D values below 30 ng/mL and 19 percent had vitamin B12 levels below 300 pg/mL. Over the course of the program, school days missed due to illness decreased and teachers reported that children were better able to pay attention after eating the meal. Hemoglobin levels increased in both treatment and control groups. Vitamin D levels increased in the treatment group and decreased in the control group while levels of vitamin B12 increased in the treatment group and remained steady in the control group. The Bracken Basic Concept Scale – Receptive was administered to assess intellectual function at baseline and endline for a subset of children. Both groups had higher scores on the cognitive test at study completion and a positive relationship was found between vitamin D and cognitive gain among the treatment group. Educational workshops were provided throughout the intervention. These included informational sessions for daycare staff, parents and caregivers to increase community knowledge of nutrition and food safety. Workshops covered the importance of micronutrients by life stage and food-related hygiene. Local experts helped develop and present information in a culturally relevant format. The latest research builds on previous work conducted by Hormel Foods showing vitamins D and B12 are of public health concern in this population. A 2011 survey of preschool-age children living in urban and rural locations in Guatemala illustrated that 36 percent and 77 percent had low vitamin B12 and vitamin D values, respectively. In response to these results, the product was reformulated to address the documented nutritional needs of the region. Hormel Foods Donation Helps Fight Hunger in the Quad Cities and Surrounding Communities Logistic Service of Hormel Foods Corporation (NYSE: HRL), announced today that it donated $10,000 to the River Bend Foodbank to help fight hunger.